First, a little business. I have decided to change the number of days that the inLinkz button will be available to link up your photo art. Until now, the linky button has been available from Thursday evening to Sunday evening. Now, the InLinkz tool will only be available from Thursday evening until Saturday evening. That means from now on, you will have only 2+ days to link up. That should be ample time. Very few links have ever been made on Sunday. This week, as usual, you can share any piece of photo art you want OR a piece of photo art that "wows" us with the light in the image. Here are three I want to share that feature light. They have all been treated in PSE to sharpen, increase saturation, blur the background, and clone out some unsightly spots. Nature's colors and designs always excite and inspire! A simple flower becomes the perfect container for light. Since I rarely do images of mainly flowers here, thought I would share this post with LeAnne's flower meme. Do click on the link and enjoy all the gorgeous flowers linked up there! They are all so gorgeous! I totally love what you did with the background in the second one and the light in the third one is so beautiful! You clearly are a perfectionist and it shows in your work. I look forward to the day I can be as accomplished. Thank you again for another week of challenge, learning and fun. That vivid green leaf is just extraordinary! If I was a caterpillar or similar creepy crawly, I would want to start chomping on it with great gusto. The white flower reminds me of that famous photo of Marilyn Monroe standing over a grate with her white dress blowing up around her legs. A lovely caption you've applied to it, too. Beautiful images, Bonnie! It's hard to pick a favourite, but I think I'll go with the middle one. I love the clarity of the flower against the abstract background. 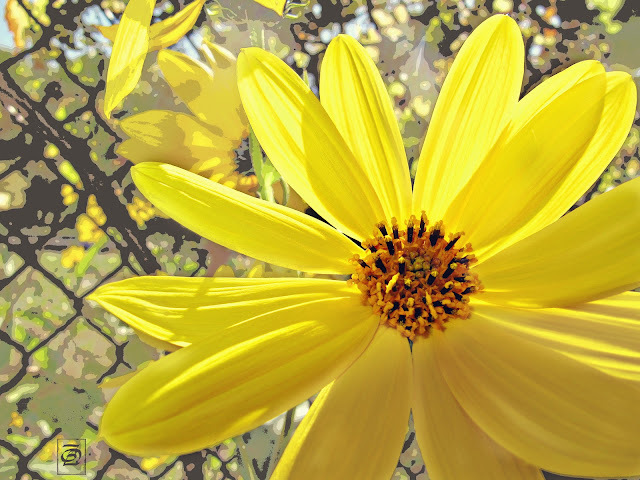 fabulous light Bonnie ~ love your 'photo art'! Wonderful works of Art in Nature. The 1st one is very intriguing. It reminds me of a road map in a way. Loved the 2nd one and how you did a posterized background. It really makes the image stand out. The 3rd one is so pretty and dreamy. Next weeks theme sounds very challenging and also fun. Your photos are stunning!!! the color is so vibrant and magnificent detail!!!! New and different. Beautiful work! These beautiful flowers, great photos, I love how the light completely discover the texture of the sheet. 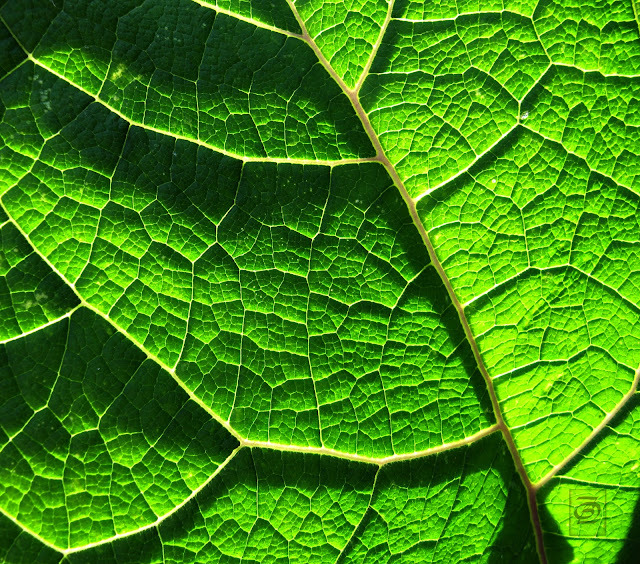 I love the gorgeous natural textures in the leaf. Lovely images. These are amazing, Bonnie! My favorite is the yellow flower, so lively and cheerful, makes you smile. :) Have a great weekend! The leaf is amazing. Usually the beauty of the flower distracts from the leaf but you really gave it the spotlight this week. The light you brought out in these photos (especially the leaf) is wondrous! Just amazing and tantalising, Bonnie!! Makes me all the more curious and eager to learn to play in the Big Girls' Playground. That leaf is sensational. I find myself noticing things In Real Life with a whole new "eye" and after seeing these I am sure the "eye candy" will continue to dazzle me even MORE. Yes, you're right, a single flower Becomes the perfect container for light. Bonnie, this was another wonderful challenge that I enjoyed very much. You are such an inspiration. Lovely light shots, Bonnie! Thanks for the challenge. 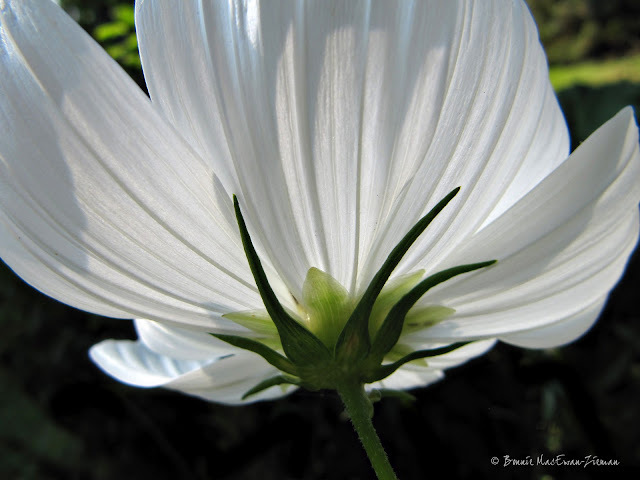 That light is magnificent on the white and I love how it brings out lines in the petals. Thanks for sharing it with Flower Art Friday! The transparency of the white flower is mesmerizing! Really. I Can't Help It! Is it too hot for a free texture?